Kiya Tomlin's new Etna storefront. Photo by Tracy Certo. Kiya Tomlin loved her five years in East Liberty. 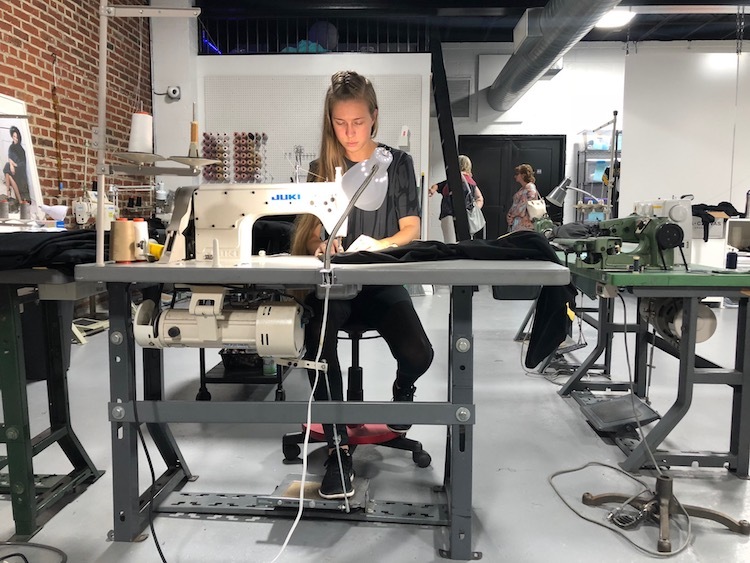 As she built and grew her athleisure fashion brand, Tomlin reveled in the challenge of running her flagship retail store on Broad Street in East Liberty and maintaining a factory and design center in Homewood. She fondly recalls her space and the joy of watching the neighborhood grow and change around her. But as the business grew, the constant commuting between the two locations left her and the staff stretched thin. 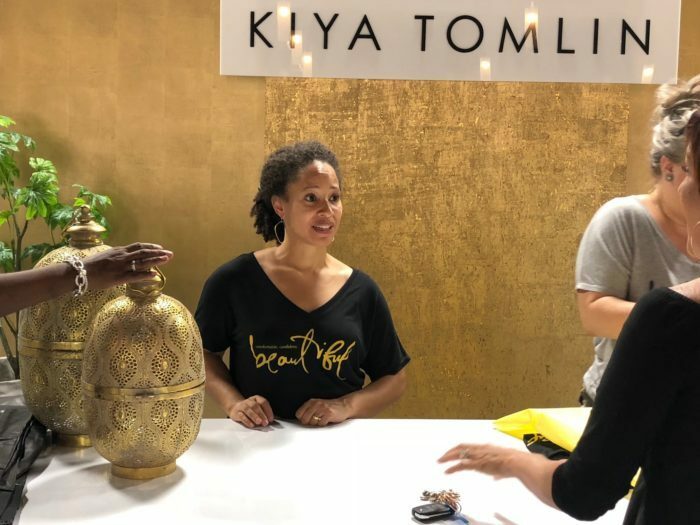 Last week, Kiya Tomlin Fashion had a grand opening party for its new location — not in trendy Lawrenceville or on fashion-focused Walnut Street, but across the river in Etna. The tailgate party shut down parts of that town’s Butler Street as models showed off the local brand’s latest wares, including her new Game Day collection. Kiya Tomlin at her fashion brand’s opening event in Etna. Photo by Tracy Certo. 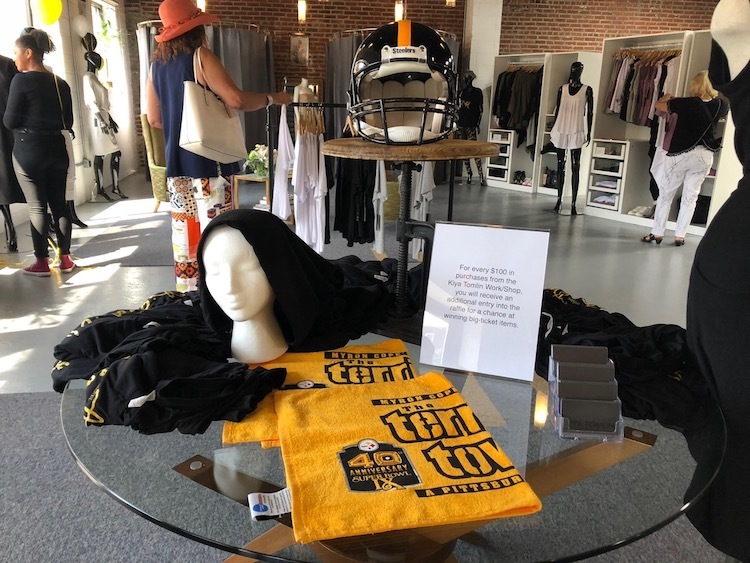 For Kiya, wife of the always-stylish Super Bowl champion Mike Tomlin, the move is a welcome change and a chance to make an impact in a new corner of Pittsburgh. The new space in Etna is large enough to bring every aspect of production under one roof, with no more worries about closing up the retail storefront while handling manufacturing issues. “I’ve always known that my dream would be to be able to manufacture and retail all in one space; vertically integrated,” she says. She’s also loving the location, which hadn’t been on her radar until her realtor showed her the space. Once she visited, Tomlin found herself charmed by the small borough and impressed by the local government. Work goes on during the Kiya Tomlin Fashion opening event in Etna. Photo by Tracy Certo. 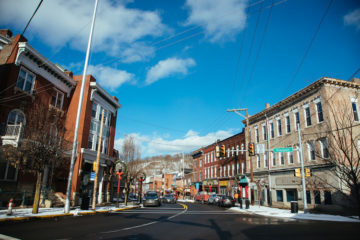 Far from being put off by being outside the city proper, Tomlin said she was eager to expand her business beyond fashionable portions of the East End. As for the future, Tomlin says she is happy to keep working at the same modest scale that defined her previous store. Everything from design and stitching to sales will be done by her and her skeleton staff of two. That includes even the big projects: While most of their work involves limited runs of clothes, some of their orders have been as many as 200 pieces of a particular style. Sound daunting? Tomlin says it’s no sweat. The new shop is located at 388 Butler Street in Etna. You can also shop online for end of summer sales and Steelers-themed items from the Game Day collection.